There are some things you cannot share with friends. Even best ones. Some secrets that are kinder just to keep. I've been working on my honesty this summer. I've told such a big lie, such a massively irreversible one, that I figure i need to somehow event the score. But the thing about lying is that it's not so easy to stop. Lies need one another, like a school of fish. If you start to separate them, they'll be killed off one by one. Sometimes the only way to keep lies alive is to tell more of them. I have the same feeling I had the first day of school when Kristen walked into the classroom. The same one I had the first week back at Kensington in January. Like I'm on exhibit in the Museum of Natural History - stuffed and behind glass. People think tragedies are blurs, that they fade together like a film dissolve, but that's not at all how it goes. The memories are sharp, jagged. When you call them up, they could slice right through you. Grief is not an easy emotion to deal with. Grief combined with guilt is even worse. Caggie's seemingly perfect life turned completely upside down when her younger sister, Hayley, drowns in the pool of her family's beach house. Four months later she is hailed a hero after she saves a fellow classmate from jumping off the roof a high rise apartment building. Caggie begins telling us the story in late August/early September, right before her new school years starts. I love the narration style Rebecca chose. Not only is it first person, but Caggie is talking to us, the reader. Normally I don't care for when the MC makes us a character, but in The Edge of Falling, it works. By talking to us directly, Caggie makes the story more personal. She delves into details she doesn't tell her best friend, Claire; her brother, Peter; or her ex-boyfriend, Trevor. She also doesn't tell us everything at once. We get mini flashbacks into Hayley's life, her family before and after Hayley's tragic death, and what really happened on the roof with Kristen. It's not until Caggie meets Astor that she begins to feel "normal" again. He doesn't pressure her to talk about Hayley, understanding the pain and grief of losing a loved one, and she feels herself slowly pulling away from her all encompassing grief, while at the same time pulling even further from her family and friends. Caggie is likable character and I fell bad for her. Her sister's death is an accident, but she cannot help but feel guilty as she was supposed to be watching her. I personally find it hard to judge characters in situations I've never been in myself. I do not know how I would act so I can't say if I would or wouldn't do the same thing. I don't agree with her decisions - pushing her family/friends away, forgoing things that made me happy, turning off my emotions - but I don't know if I can necessarily fault her either. 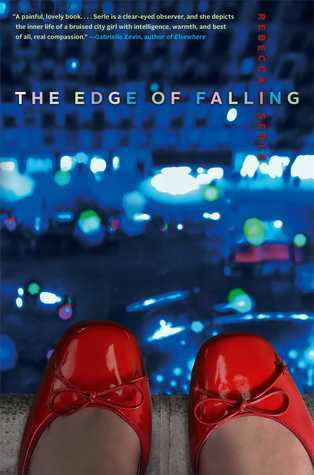 The Edge of Falling is a beautifully told story, both in plot and writing. You'll definitely feel numerous emotions throughout (love, grief, pain, hope, understanding, acceptance) and you'll connect with Caggie as she attempts to heal and learn to once again live her life.